Social butterflies like to spread their wings meeting new people and bringing guests into their homes. They may even like to host dinner parties for their guests. For big gatherings like these, it is best to have a large stylish elegant dining table to cater for the many people in your home. Decor8 Hong Kong furniture has a stunning recommendation that would suit your needs. We present to you the Marble Oval Table. When deciding whether the Marble Oval Table will fit into your room, there are a couple of things you need to take into account. The available space you have in the room along with the size of the table. You need to cater for the space that will be occupied when the chairs are in use and pushed in when not in use. The table itself can comfortably cater for 6 people. The maximum number of chairs that can go round this table is eight, but it will be a tighter fit compared with having six chairs round it. 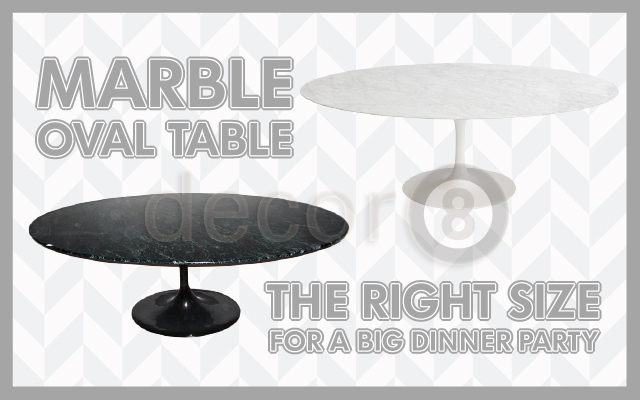 Each Marble Oval Table features a tabletop, which is a product of nature and no two pieces are exactly alike. This marble top surface is supported by a slender elegant stem base inspired by the shape of a tulip and is made from metal. We have two variations of this table, you can either get the white marble with white base or the black marble with black base. If you are worried about deciding what chairs to pair this table then worry not. This table looks beautiful with a large selection of chairs. The main thing is to find a chair that would help to complement the table. If you want to see the Marble Oval Table in all it’s glory, we highly recommend coming down to one of our showrooms to view it with your very own eyes. This entry was posted in Conference Tables & Meeting Tables, Dining Tables, Tables and tagged big dining table, conference tables, dining table hong kong, large size table, marble tables, oval dining tables, white marble. ← Organic Poet Sofa Is Anything But Ordinary!